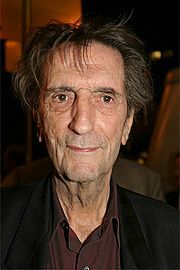 Harry Dean Stanton (July 14, 1926 – September 15, 2017) was an American actor, musician, and singer. He was known for his roles in Paris, Texas, Kelly's Heroes, Dillinger, Alien, Repo Man, Pretty In Pink, The Last Temptation of Christ, Wild at Heart, The Green Mile, The Pledge, and Rango. Stanton was a favorite of the late movie critic Roger Ebert who has said that "no movie featuring either Harry Dean Stanton or M. Emmet Walsh in a supporting role can be altogether bad." However, Ebert later admitted that Dream a Little Dream (1989), in which Stanton appeared, was a "clear violation" of this rule. Stanton was born on July 14, 1926 in West Irvine, Kentucky. He studied at the University of Kentucky. Stanton died on the afternoon of September 15, 2017 at a hospital in Los Angeles, California of lung cancer at the age of 91. Harry Dean Stanton Facts for Kids. Kiddle Encyclopedia.